So you are probably wondering why I am posting a pumpkin recipe less than a week before Christmas. I’m going to be completely honest with you. I don’t really like Christmas. I think it’s over-commercialized, the malls are too crazy and Christmas trees make a mess on the floor. I know, I know I sound like a Grinch. I just love fall so much that I feel like Christmas cuts it short. So I try to extend it as much as possible. Plus, this was the recipe I have been waiting all fall for. Partially, because I used my new KitchenAid Pasta Attachments, which made this so simple. 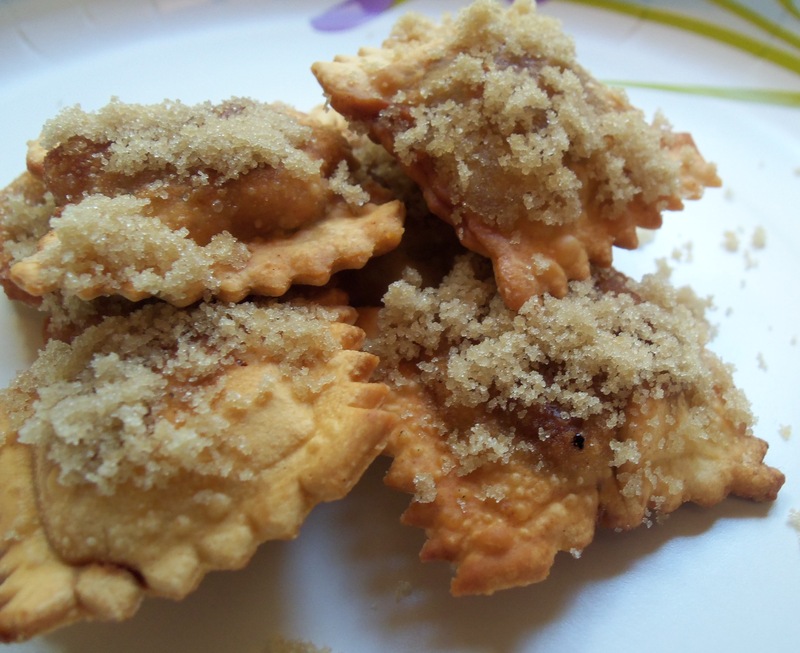 My friend told me they tasted like mini fried pumpkin pies in your mouth. (1) Put the eggs, water, flour and salt in a mixing bowl. Attach a flat beater and begin mixing for 30 seconds to a minute. If you have a dough hook attachment use that and knead the dough for about 2 minutes. If you don’t have a dough hook, then I would just continue to use a flat beater. Remove the dough from the bowl and hand knead for about a minute or two. The dough will be tough and it may be hard to knead, but try to do the best you can. Wrap the dough in plastic wrap and let rest for 20 minutes. (2) After the dough has rested, divide the dough into four pieces, that are about the size of tennis balls. Take one of the balls out (keep the other three wrap in plastic wrap so they don’t dry out). Put the ball through your pasta roller attachment on setting 1 for about 3 or 4 times until flat and smooth. Turn your setting to 2 and feed the dough through 2 times. Do the same with setting 3 until the dough is very thin and smooth. 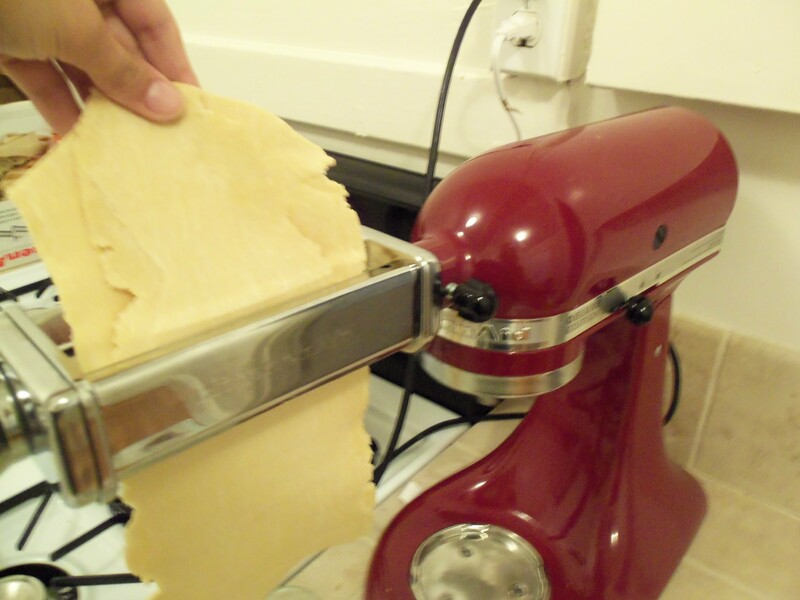 If you don’t have a pasta roller attachment, do not fret. You can still make pasta. Just use a roller, flipping the dough every few rolls. Just make sure the dough is very very flat (about 1/8 inch thick or about 2 quarters thick). (3) Mix all of the pumpkin filling ingredients together in a bowl. It won’t seem like a lot of filling, but it should make about 24 raviolis. Remember you don’t want to have too much filling or you won’t be able to properly close the ravioli. (4) If you have a ravioli attachment, follow those instructions. Just make sure to only put enough to fill the little hole. You don’t want to waste filling and you want to be able to close it. If you don’t have a ravioli attachment there are other options. (a) You can use a Ravioli Maker and Press. 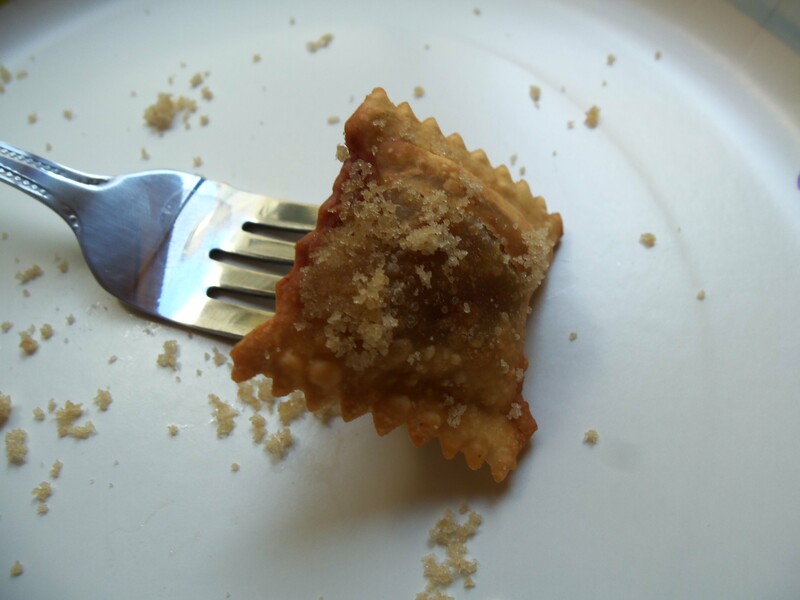 (b) Use a small square cookie cutter to cut all of the pasta sheet. 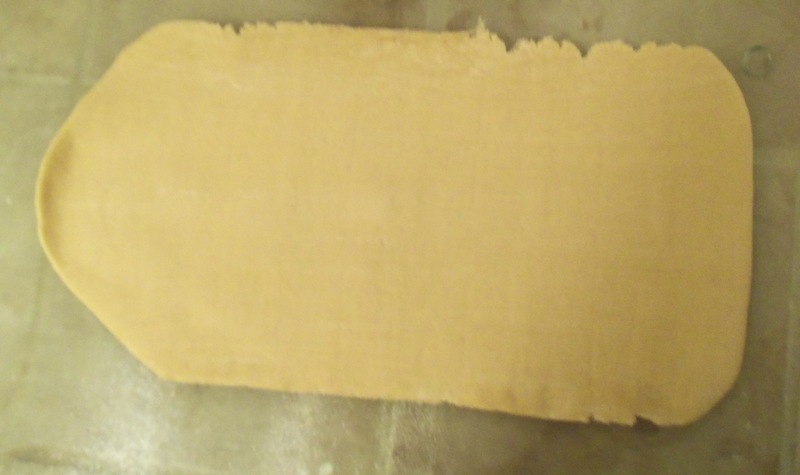 Then put a small amount of filling in the middle of one of the squares. Put a second square on top and use a fork to pinch the edges of the squares together. (5) Fill a frying pan with about two inches of olive oil (you also may be able to use shortening, but I haven’t tried this yet to know). Let the oil sit until it starts to bubble slightly. Start with just one ravioli at a time. It will fry quickly and you need to see how quick before you throw them all in. It likely won’t take more than 30 seconds on each side, and sometimes it will take less. (6) Place the ravioli on a napkin covered plate. 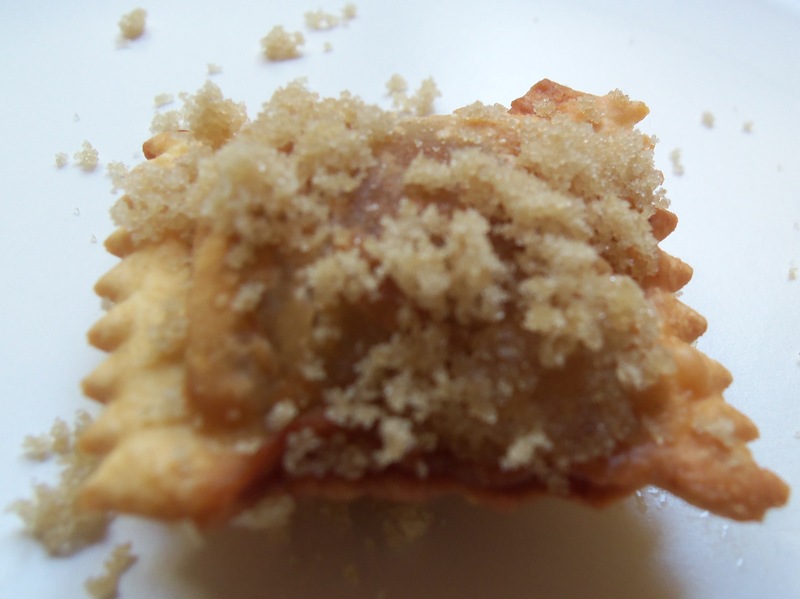 Immediately, sprinkle brown sugar on top of the ravioli. I didn’t try this, but next time I’m going to spoon a little bit of honey on top of the pumpkin ravioli and then sprinkle the brown sugar. That sounds fantastic! If you try it please tell me how it turns out!